12 The earth brought forth vegetation: seed-bearing plants of every kind, and trees of every kind bearing fruit with the seed in it. And Hashem saw that this was good. While God created and put in place the potential for vegetation on the third day of creation, it was not until later, Genesis 2:5, that rain fell enabling the vegetation of the world to blossom and bloom. During creation, the land was poised to allow its seeds to sprout, but God did not bring forth rain to allow them to grow until there was a person able to recognize the necessity and pray for rain. During its short rainy season, the Land of Israel is dependent on adequate rainfall to produce its yearly crops. 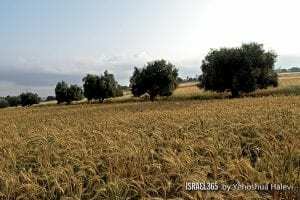 It is God’s design that the Jews living in Israel are to strengthen their relationship with Him through daily prayer requesting adequate rainfall and a successful agricultural season. Since Hashem desires a deep relationship with man, He incorporated the need for prayer, the ultimate form of dialogue between man and God, within the natural order.